While EMP grew in industrial circles, Ed’s passion for cooking, in particular, his childhood memories of family gathering to enjoy the Argentine asado style of grilling and cooking, was always in the back of his mind. With Ed’s machine design experience, and a full production machine shop at his disposal, he began to prototype out what would eventually become the standard Gaucho Grill used in parrilla style grilling. In time, and quite a few revisions and modifications, Ed was known as having the best grill on the block. Once his concept was proven and well received, the natural thought was why not create this for the public? And thus Gaucho Grills was born. Gaucho Grills, now available through the internet at gaucho-grills.com, has been created to offer all passionate grill masters and those that desire the best in outdoor cooking an opportunity to grill with Latin flavor and function. All Gaucho Grills and Gaucho Inserts (grill bases designed for customer built counter tops and fireplaces) feature Argentine parrilla style grilling, with a robust construction that will outlast any other grill on the market. Argentine passion, coupled with American craftsmanship. 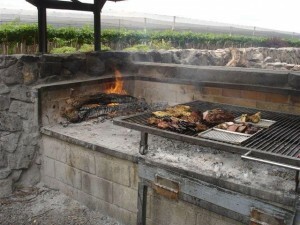 A true Latin parrilla style grilling system is being custom built here in the United States.